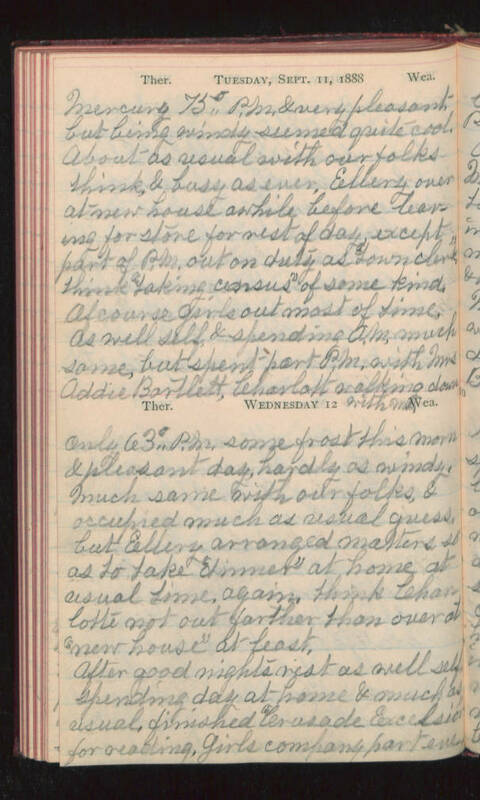 Tuesday, Sept. 11, 1888 Mercury 75° P.M. & very pleasant; but being windy seemed quite cool. About as usual with our folks think, & busy as ever. Ellery over at new house awhile before leaving for store for rest of day, except part of P.M. out on duty as "Town Clerk" think "taking census" of some kind. Of course girls out most of time. As well self, & spending A.M. much same, but spent part P.M. with Mrs. Addie Bartlett, Charlotte walking down with me. Wednesday 12 Only 63° P.M. some frost this morn & pleasant day, hardly as windy. Much same with our folks, & occupied much as usual guess, but Ellery arranged matters so as to take "dinner" at home at usual time, again. Think Charlotte not out farther than over at "new house" at least. After good nights rest as well self spending day at home & much as usual, finished "Crusade Excelsior" for reading, girls company part eve.